← The “End” of Us? Posted on June 19, 2015	by Rev. Joe Jagodensky, SDS. What’s with this? Your time of panic does not coincide with someone’s beautiful day. Your friend’s helplessness about her daughter does not fit the joyful feeling you’ve just received from your daughter. The syncing is missing. The apostles are going nuts and Jesus is doing his nails. Jesus is throwing stuff out of the temple and his apostles are waiting for the Bingo numbers to be announced. There’s that syncing problem again. We’re supposed to be united and one in faith but the separations can be severe. Obama wins his first term, I come to work beaming only to see numerous gloomy faces. I kept my mouth shut..but only for a while. I couldn’t resist exhibiting my joy in the midst of their forlorn faces. So how do we do it? How do we validate the experience of someone that may be unlike our own? Arm wrestle? Too barbaric. Argue about whose experience is more important? Too television these days. Ignore the person? Too much like being in high school when you’re in your 80’s. So how do we do it? We fake it. I can act forlorn while being happy. I can pretend to be abiding while keeping to myself. I know you all can as well. I like to call it being buoyant. A buoy is grounded securely in the water while being able to move from side to side, sometimes even with a bell. We are all grounded in Christ and the mission and purpose he fulfilled for our salvation. The “Christ” part is all below the water, the grounded part. The part of the buoy that is seen is the bobbing that we do everyday. One encounter meets an upset person and your next is a smiling person dying to tell someone the news she’s just heard. You respond as best you can to both. 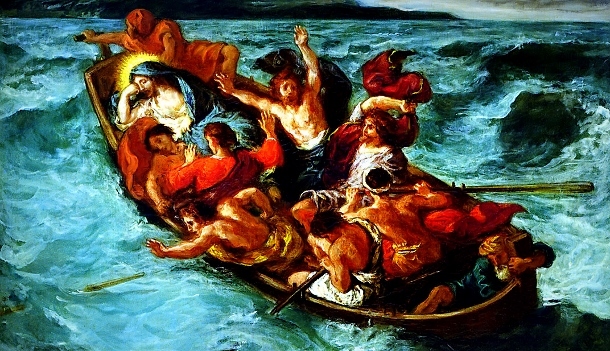 Whether calling it “faking it” or being a “buoy” doesn’t matter because of the grounded Christ, the unifying Christ, the Christ who suffers with others, the Christ who models the best for us. Jesus doing his nails while the apostles are ballistic is his excuse. He was a teacher, trying to teach a lesson. Our task is to be “buoy people” to each other – not to teach, change or rearrange anyone but to buoy as best we can for each other. The “bell?” I’m not sure how to apply the bell but let’s just say that it’s the bell that triggers our un-felt empathy toward someone’s true feelings.